The small town of Yorktown lies in Westchester County, New York. Home to about 30,000 residents and a huge selection of historic homes, this little town is a great place to enjoy a summer picnic in the park. Visitors appreciate the large selection of parks like Croton Gorge Park that are perfect for biking, hiking, and enjoying the sunshine. Visitors also appreciate the variety of emergency dentists that are available in the area of Yorktown. The Emergencydentistsusa.com website makes it simple to select your new Yorktown emergency dentist. Just log onto our website and scroll through the list of hand-selected dental clinics. Click on the dental office that interests you, and set up that first dental appointment. You can find driving directions, office hours, insurances accepted, and even services provided at each dental clinic right on the Emergencydentistsusa.com website. Want a little more help picking out a great dentist? Call our toll-free dentist finder hotline to speak with a caring agent who is standing by to answer your questions. Your agent can set up your first appointment and give you driving directions if needed. Remember to bring your dental insurance card and a photo ID with you to the dental office for that first appointment. Arrive early to fill out the new patient paperwork. Yorktown is a great place to be when the weather is warm in New York. It is also a great place to find a new emergency dentist. Just scroll down to see some of our top dental choices listed below. 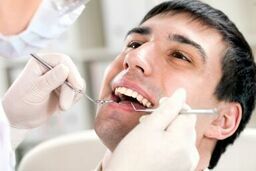 Description: Personalized and comfortable dental care are on the agenda at the Family Dental Group of Jefferson Valley. This full-service dental clinic has office hours designed to make it simple to handle your emergency. Family Dental Group of Jefferson Valley is open six days each week and offers same day emergency care whenever possible. Description: Ongoing professional training and state-of-the-art technology make Dr. Keiles’ office a favorite in the Yorktown area. Working hard to assuage dental fears, this dental office promotes an atmosphere of caring and warmth. Convenient office hours make it simple to have your dental emergency handled quickly. Description: This husband and wife dental team works hard to promote kindness in the dental office. From cosmetic procedures to restorative care, this dental office offers a huge selection of services. Children and adults are welcomed and same-day emergency care is offered at Ledner and Zaiff Dental Designs. Tooth pain is often accompanied by a broken tooth, a lost filling, or even an abscess. Any tooth pain that lasts for more than an hour or two requires a trip to your emergency dental clinic. If your tooth pain began with an accident or a fall, head straight to the nearest hospital emergency room or urgent care center. This ensures that you do not have more dangerous injuries than a broken tooth or a painful toothache. Head to your emergency dental office as soon as possible to have your painful tooth examined. The New York State Dental Association’s website is a great place to check out your new dentist’s current licensing and credentials. Just log onto the website and enter your dentist’s name into the search box. View licensing documents and other information about your new dentist right from your own computer. It is important to verify your new dentist’s licensing so that you are sure he or she is able to practice legally in the state of New York.